Welcome to the ZapWorks Ancient History Competition. Submit your entry before Friday 30th Nov 2018 for the chance to win $1,000 and a ZapBox! Using AR to tell immersive stories that educate and inform an audience on a given topic or business problem is one of the best ways you can utilise the tech. That’s why for the 5th ZapWorks user competition we’re challenging you to build your very own ancient history-themed AR experience that educates and excites users on your favorite part of ancient history. 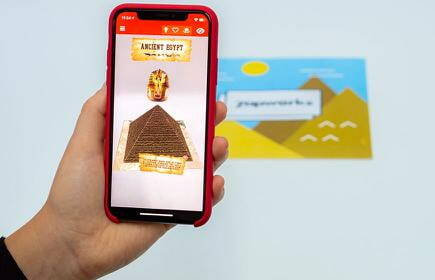 Inspired by some of the most impressive civilizations and empires from ancient history such the Egyptians, Romans and Greeks, we want you to create an AR experience that brings these ancient civilizations back to life using ZapWorks Studio. In terms of Studio functionality, we are offering you free reign to create a winning combination of any of the functionality and techniques we’ve used (and you’ve seen others use) in previous ZapWorks competitions including 360 Gyro, headset mode, masking and 2D and 3D animation. This is also a fantastic opportunity to use functionality you might not have worked on in the past (like dynamic lighting). As well as asking you to create an experience using an ancient history-themed environment, we are looking for you to include some additional layers of interactivity and entertainment. Submissions will be judged on how well the experience educates, informs and entertains the end user on their chosen part of ancient history. The winning entry will be the one that combines creative flair with educational value. You are free to enter as many times as you wish, but please be aware that only one of your entries will be considered for the competition. If you submit more than one experience please specify which experience you’d like to be considered for the competition. The winner (1st place) will be selected and announced on Wednesday 12th December 2018 on Zappar’s web properties (www.zappar.com, zap.works, docs.zap.works, my.zap.works & forum.zap.works), social channels and email newsletter. Winners will, in the first instance, be contacted via email. *Entrants may use the ‘AncientEgypt.zpp’ file as a starting point for your submission only. To be in with a chance of winning, entrants should add a new mechanic, element or level of functionality to the experience that sets it apart from the original.